Ashley Jade - artist Ashley Jade is a native Arizonan. She was raised in Phoenix and now resides in Scottsdale. She studied art in Southern California at Orange Coast College; in Tempe, Arizona at Arizona State University; and in Scottsdale, Arizona at Scottsdale Community College. Her work has been seen in many shows in Southern California, including Artegeo Gallery and P.J. Meads. Her local exhibits include The Candle Factory and Abracadabras, both in Central Phoenix. She has done many commissioned pieces for private collectors. A model, actress and photographer, she has always excelled in the creative field. 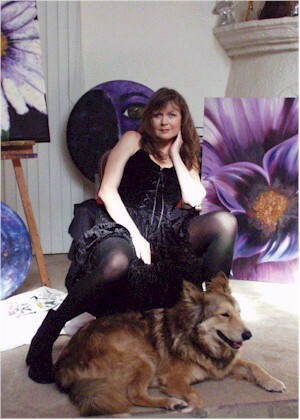 Her passion for the arts is reflected in her paintings. "I paint what I love and know" she says. "My paintings should be viewed with an open and relaxed state of mind. Preferably in a candle lit room, where their magic shines the most."